Detail of the Abduction of Europa mosaic from 3rd cent Byblos. 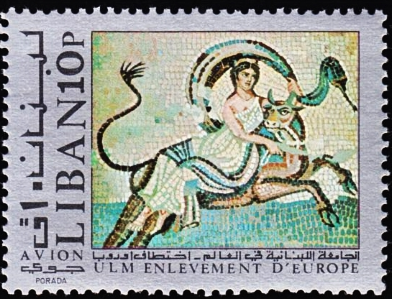 France released thisto draw attention to, and the need for, Lebanese cultural heritage preservation and as adverting for the exhibition, 'Lebanon: The Other Bank', on at the Arab World Institute from Oct 27 1998-April 30 1999.
a 1971 Airmail stamp with the same mosaic as above to raise publicity for the World Lebanese Cultural Union. 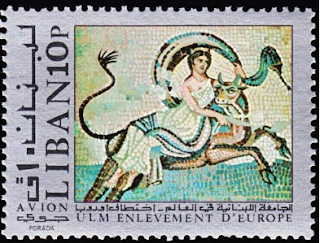 The mosaic can be seen at the National Museum of Beirut. There is also 40p stamp of the same design, with a gold border.